Alcohol Depression: Does Drinking Make You Depressed? Alcoholism can CAUSE depression or intensify existing symptoms of depression. This statement may “ring false” at first because if you have resorted to having a drink or two when in a depressing situation, you know from experience how a cocktail or a glass of wine seems to lift mood and seems to make us forget our woes. At least for a while. So the idea that alcohol causes depression sounds counter-intuitive. However, there is a wealth of scientific research that suggests that alcoholism indeed increases the risk of a person developing depression. Alcohol also magnifies the symptoms of any existing depressive disorder. According to findings, about 30 to 50 percent of all people with alcohol use disorders also suffer from depression. The connection between depression and alcoholism runs both ways, and it runs deep. In this article we discuss depression and alcohol, and how interrelated they are. If you or someone you loved are dealing with alcoholism and depression, and you would like to know more or ask questions about this subject, please call our 24-hour hotline at (888)-459-5511 to speak with a knowledgeable representative. Does Depression Lead To Alcoholism? There is a reason why so many people reach for an alcoholic drink when they are feeling the blues. That’s because, alcohol can truly lift one’s mood, at least for a while. According to research by a team of scientists at the Ernest Gallo Clinic and Research Center at the University of California, San Francisco, drinking alcohol triggers a rush of endorphins (the “happy chemicals”) in the orbitofrontal cortex and nucleus accumbens, the areas of the brain responsible for producing feelings of pleasure and reward. A person feels happy when he drinks alcohol because of the endorphins released in the brain. The brain recognizes the release of endorphins as a pleasant experience, and thus subtly urges the person to drink more alcohol whenever he feels depressed. So on one level alcohol does cause you to feel a little less sad or depressed. And because drinking results in feelings of pleasure, people tend to take refuge in it the next time they feel down in the dumps. As the person continues to drink, more endorphins are released, creating more intense feelings of pleasure. The brain is thus “conditioned” to recognize alcohol as being pleasant. The person starts to drink more frequently to experience more pleasure. He or she begins to rely on alcohol to relax and feel happy. He or she eventually develops alcoholism. Yes, according to the American Psychological Association, alcoholism triggers depression or worsens existing symptoms of depression. Alcohol makes you feel depressed because chemically it is really a depressant. When consumed, alcohol has a sedative effect on the brain, at the same time it triggers the release of endorphin and dopamine – the “happy hormones.” Alcohol can cause depression because when the initial effects of drinking fade, levels of these hormones also drop, making the user feel depressed. By intensifying the effects of GABA: Alcohol magnifies the effects of the “inhibitory” neurotransmitter GABA, which causes a sedative effect. Incidentally, GABA is the same neurotransmitter that drugs like Xanax and Valium affect and cause sleepiness. By causing an imbalance in the action of neurotransmitters: Chronic alcohol consumption disrupts the fine balance between inhibitory and excitatory neurotransmitters. This can result in alcohol-induced depression and other mood disorders. By causing a dopamine and endorphin crash: Alcohol triggers a release of the “happy chemicals” dopamine and endorphin in the brain. This explains the “high” that people experience after drinking a few glasses of any alcoholic drink. But the effects taper off when the levels of these chemicals come down. This is when feelings of low and depression set in. By impairing emotional processing: Alcohol damages the right hemisphere of the brain that is involved in processing non-verbal emotional stimuli. Alcoholics often have difficulty interpreting correctly facial expressions and as a result, feel hurt, persecuted, or threatened by others for no reason. This makes many alcoholics withdraw from society and live in isolation, a behavior that intensifies their depression. Chronic alcohol consumption blunts the effects of antidepressant medication. Alcohol consumption clouds the senses and makes thinking fuzzy. Under the influence of alcohol, people have been known to be reckless and commit acts that they regret later—engage in violence or inappropriate sexual behavior or get involved in a DUI case. This “fuzzy thinking” is probably why many people find that alcohol causes depression the next day after drinking, or as some call it, post-alcohol depression. Alcoholism takes a toll on personal relationships. Alcoholics are often unable to perform the personal and professional duties expected of them. This can cause stress, anxiety, and yes, depression. Alcoholism often leads to financial problems; addicts are known to go bankrupt as they try to fund their drinking habits with loans. Alcoholism can cause a person to perform poorly in the workplace and as a result, lose his or her job. Again, many people experience depression the next day after drinking alcohol, and this can affect work performance. Alcoholism may make a person neglect and/or abuse his or her children and as a result, have them taken away by Child Welfare Services. Alcoholism and depression is a vicious cycle. On the one hand, the depression after drinking alcohol makes a person drink more, and that worsens his or her depressive mood. On the other hand, depression can lead to alcoholism that, in turn, aggravates the symptoms of the depressive disorder. The more a person drinks in a single sitting, the more intense is the “high” he or she experiences. As a result, the crash that comes afterwards – the feelings of “low” – is also more intense. Binge drinking is a form of problem drinking behavior that can develop into full-blown addiction in a short period of time. Alcoholism then increases the risk of the person developing depression. People whose families have a history of alcoholism tend to have lower endorphin levels. This means that they are more prone to depression and also have a higher chance of becoming alcohol dependent. While it is generally agreed that alcohol does make depression worse, it is probably futile to ponder the question of which develops first: alcoholism or depression. There are as many neurological and environmental factors that trigger alcoholism in people with depressive disorders as there are factors that contribute to depression in alcoholics. But what is interesting is that scientists have uncovered genetic links between alcoholism and depression. 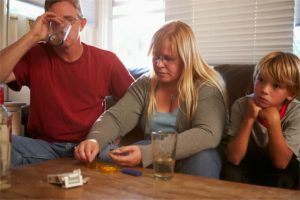 People from families with a history of alcoholism tend to have lower levels of endorphins than those who do not have close relatives with alcohol use disorders. Endorphins are involved in the identification of rewards and pleasure responses. Low levels indicate that the person has reduced pleasure arousal and is prone to depression. The incidence of alcohol dependence and depression occurring together tend to run in families. The greater the number of first-degree relatives who have co-occurring alcoholism and depression, the greater is that person’s chance of developing this co-morbid condition. According to the findings of a study on twins, a history of major depression in one identical twin greatly increases the risk of alcohol dependence and/or abuse in the other identical twin. Women are more prone than men to suffer from co-occurring alcoholism and depression. According to research, there are both genetic and environmental factors at work here. However, the most severe consequence is the high rates of suicide amongst people who suffer from alcoholism and depression, according to research conducted at the Western Psychiatric Institute and Clinic of the University of Pittsburgh Medical Center. The feelings of listlessness, despair, and hopelessness brought on by depression are potent enough to trigger suicidal thoughts in individuals or actually drive them to take their own lives. Ironically, many of these suicides occur as a result of alcohol withdrawal depression, in people who are trying to stop drinking but are overcome by depression after quitting alcohol. This is one of the reasons why alcohol recovery specialists recommend professional alcohol and depression treatment, and not trying to suddenly quit drinking on one’s own, especially if already depressed. By depressing inhibitions: Chronic alcohol consumption damages the prefrontal cortex, a region of the brain involved in executive functioning that helps one plan and regulates behavior. Alcohol consumption depresses inhibitions and makes one behave impulsively. By clouding judgment: Alcohol impairs rational thinking by depressing activity in the cerebral cortex, the region of the brain involved in processing thoughts and developing consciousness. 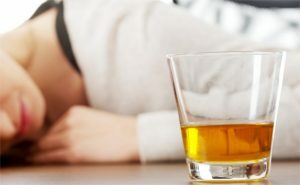 A person under the influence of alcohol is unable to think straight, connect the dots, and arrive at rational conclusions. He or she cannot gauge the consequences of self-destructive actions and make the right decision. By triggering binge drinking behavior: Those who suffer from both alcoholism and depression tend to binge drink more than people who have one disorder or none at all. Binge drinking raises the risk of alcohol poisoning, a situation where the person loses all control over his or her mental faculties and is at a greater risk of harming himself or herself. The connection between alcoholism and depression is evident. If you have been diagnosed with depression or feel that you are often depressed, seek psychiatric help instead of self-medicating with alcohol. If you are a chronic user of alcohol or abuse it, go to an addiction counselor who can help you modify your drinking habits. 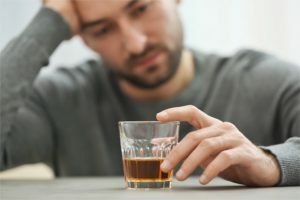 If you are a medical professional who works with people with depressive and/or alcohol use disorders, ensure that you educate your patients on the connection between the two disorders and how one can trigger another. As a medical professional, you should also yourself screen a patient suffering from depression for alcohol abuse symptoms and vice versa, to rule out co-morbidity. Alcoholism and depression throttle life and waste potential. Knowing about the connection between alcoholism and depression will help you break a vicious cycle that can otherwise lead to catastrophic consequences. The key is always to seek medical help to manage the condition(s). In this article we have discussed depression and alcohol, and how interrelated they are. If you or someone you loved are dealing with alcoholism and depression, and you would like to know more or ask questions about this subject, please call our 24-hour hotline at (888)-459-5511 to speak with a knowledgeable representative.